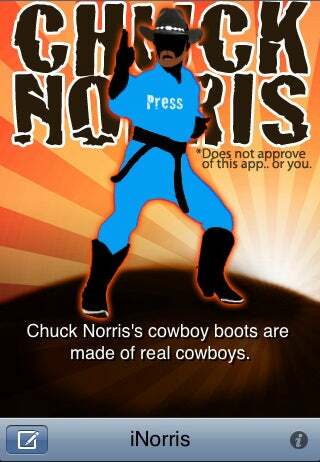 Apple Now Rejects iPhone Apps Because They "Ridicule Public Figures"
Reader spectralogue tells us that this Chuck Norris joke generator app was just rejected by Apple because it "ridicules public figures." Wait, what? We wouldn't say randomly displaying statements about Chuck Norris, which have been all over the net for half a decade now, qualifies as "defamatory content." But then again, we're not on the approval committee for Apple. Nor, are we fans of Chuck Norris jokes. Our parents might still be though, so who is Apple to deprive our parents of corny joke enjoyment?